A new chapter in your career begins with the required real estate license education to complete your Texas Real Estate License. 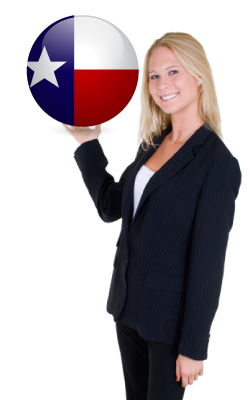 Real Estate is an exciting and rewarding career and we have made earning your Texas Real Estate License very easy. Get started today and not only learn the requirements to pass the exam but learn what it will take to be successful. Choose From 6 TREC Approved Providers! Now includes Exam Prep for Free! These five Core Courses are required of all salesperson applicants. Textbook Included: Modern Real Estate Practice with FREE shipping! Get our quality guarantee and exam prep! This 180-hour package contains everything from "The Basic" package PLUS our National Real Estate Exam Prep which is comprised of the major testing formats found in real estate state exam testing and includes the ten crucial topics found on all testing service exams as well as the majority of state exams. Additional highlights include (2) 100-question practice exams (one for salesperson and one for broker). You can have confidence in your level of preparation knowing that, all in all, our exam prep covers 1,000 questions on real estate content! Access to the Virtual Study Program! *In the instance that one of our students does not pass the state exam on the first try, Career Webschool will reimburse that student for their second state exam fee. To be eligible for reimbursement, the student must take the state exam within 1 year of completing our course and must have also passed our course exam with a grade of at least 80%. "The Basic" package has everything you need to fulfill the 180 hour Texas real estate education requirement to qualify to sit for the state exam to become a real estate salesperson. Texas Principles of Real Estate: Gain a foundation in Texas Real Estate Principles. Fulfill both the Principles I & II Texas core requirement with this 60 hour course. The focus for this real estate course is on property transfer, property ownership, real estate licensing, real estate math, finance and fair housing. Texas Promulgated Contract Forms: Get a core understanding of promulgated contract forms in Texas. This 30 hour course focuses on the broker-lawyer committee, commission rules, unauthorized practice of law, current promulgated forms and case studies. Completion of this course satisfies the core course requirement for Texas for Promulgated Contract Forms. Law of Agency: This course focuses on agreements with buyers and sellers, intermediaries, agency concepts, fiduciary duties, employment issues and agency termination. Law of Contracts: Learn the law behind contracts. The curriculum focuses on contract creation, contract law, contract forms and breaches and provisions. Real Estate Finance - This course focuses on the set of concepts and techniques used to analyze and finance income-producing real property. You Can Pay More. But Why? Competitors prices are considered accurate as of time of research and are subject to change. Feel free to visit the competitors site for up to date pricing. They are easy to find. Most of the time our providers are offering discounts on popular courses. Just click on the Get Started button to see the discounted price. The prices listed here are the typical retail prices.